I would like to write about Path MTU discovery and IP Fragmentation in this post and the relation between them. LINUX1 gets this ICMP and lowers its further packets’ maximum sizes to 800 then the packets flow through. Ok, fair enough so far but there is a concept of IP Fragmentation, why doesn’t it occur? This is what documents say if the next link MTU is lower than the packet being forwarded, packets are fragmented. This setting in LINUX1 device causes every packet to have DF (Don’t Fragment) bit to be set to 1 which means, don’t let any intermediate router to fragment this packet. Below is a screenshot indicating how you will see packet during a capture in Wireshark. Can you see the Don’t fragment bit? As you can see TCP three way communication is done properly but once LINUX1 tries to send a segment above 800byte (in the output it isn’t visible but 289 and 290. packets’ total lengths are 1500 for each) it receives the above ICMP response (Destination unreachable Fragmentation needed) from LINUX2 and it lowers further packets’ sizes to fit in 800byte limit. Can you see it? Now LINUX1 linux knows that it shouldn’t send any packet bigger than 800 byte if it wants to send a packet for this destination again. This cache expires in 596sec as it can be seen in the output. I have noticed that even if you have packets flowing in this direction, expire value continues to count down to zero. So having an active connection doesn’t mean that this value will be reset to its upper limit again and again. During my troubleshooting, I asked myself what happens if I just block every ICMP packet sent from LINUX2 device. The answer is communication halts!!! because LINUX2 doesn’t provide any feedback about the next link MTU and LINUX1 keeps sending its packets still at 1500byte. Since DF bit is set, fragmentation can’t happen and everything is stuck. This is a very bad thing indeed! I again asked another question, what can I do from LINUX3 side to prevent this from happening if I can’t inform LINUX1 admin. MSS (Maximum Segment Size) comes in this situation. After this all the subsequent TCP SYN packets will advertise its MMS as 700 and because LINUX1 will obey this and arrange the packet size according to it, packet flow will not be disrupted. I hope I haven’t made a mistake so far in my post. Let me know if you have any contribution or questions. Note1: I was wondering how TCP keeps its per connection variables. For example MSS is only announced during connection establishment but no where else but then the entire connection knows that MSS has such a value. I think Transmission Control Block RFC http://www.ietf.org/rfc/rfc2140.txt is the key to this question. Note2: I have discovered some behavior after 1 year that this post was published. The setting net.ipv4.ip_no_pmtu_disc is only working if you are the TCP sender. At least in my test on Ubuntu. For example if you are the web server (responder), net.ipv4.ip_no_pmtu_disc setting has no effect , no matter what you do every IP packet has DF bit is set to 1 in TCP segments (replies). I don’t know the reason why we can’t manipulate this behavior. There may be a reason or an option to change it but couldn’t find it yet. Hi, what about udp ? On Netscrren you have set flow path-mtu. I didn’t get the question clearly indeed. You mean MSS in UDP or something? There is no such thing I suppose. If you can articulate what you mean, I would be pleased. no I did not thinking of MSS for UDP. If we start with Screen OS, we are running traffic through vpn tunnels and default mtu is 1500. So if you configure screen with set flow path-mtu, in that case if you ping with DF you get ICMP messages back if you have lager packet then 1418.
ping -f -l 1418. So it should meens that for UDP packets with DF we get ICMP need to fragment packet. 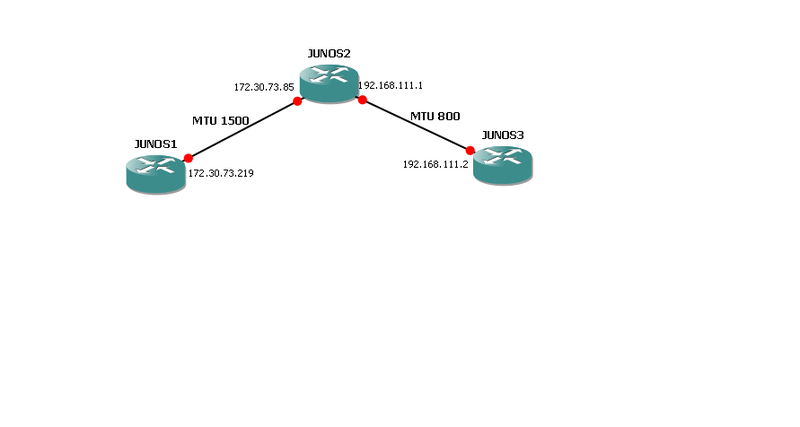 But if we goes to Junos, its seems we not have that options, if a UDP packet is lager with DF Junos will fragment this packet over the vpn tunnel. root# set security flow tcp-mss ? Thanks Craig. This is a very handy command yes and a life saver in many situations in which you have MTU or some performance issues due to fragmentation.